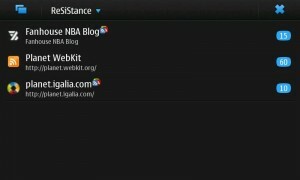 I delayed a bit ReSiStance development during last months because we had a lot of work in Igalia’s WebKit team. But I managed to find some time during Xmass to advance some work and to review a couple of pending patches. The most important ones were by far, the Google Reader support ones. It all started with some sensational work done by Chus Picos. She did almost all the research regarding the status of Google Reader API (check here if you’re interested) and cooked a very nice set of initial patches. Thank you very much for the great work o/o. Note that being a mobile app I tried to minimize network traffic as much as possible, and thus, no synchronization is performed automatically except the read status update as you read. we could realize that another new cell renderer was also developed to show the amount of unread items (and yes the background color is taken from the theme) inside a rounded corner rectangles. Summing up, this new release not only adds some changes in the UI but tons of them in the guts of ReSiStance, so give it a try if you like it and tell me any bug you might find. Take into account that you need to setup the extras-devel respository in your N900 to have ReSiStance listed in the Application Manager. For those interested in the code, you can get it from the git repo as usual. ← WebKitGtk+ HTTP cache ready! I’ve installed it, but it takes forever while “Connecting to Google Reader”. How do I know if ReSiStance is actually doing something? great application, thank you all! Good old “grr” instead seems to get all the content of feeds via google reader so this way it only starts one connection and because of this is much faster, right?! Do you have any plan on using / providing this way too? @ReinoutS: Open a terminal and type “netstat -at”. If you see some hostnames corresponding to feeds you have in google reader, then resistance is definetly doing the right thing. It took quite a while on my device too. Yes, syncing with Google Reader is taking ages to finalize. Hi, it’s not that it takes many time to sync, but also the whole night and it has not synced at all. @Daniel thanks for reporting. Actually some other guy told me about this. The problem arises with feeds inside folders. I’ll try to release 0.8.1 with a fix for that ASAP. Well, that is good, but a little bit unfortunate aspecially on wifi connection. When I launch RSS reader, I want to read what is new, so an autosync (I guess I mean update) on launch would be a nice feature (if it does auto-sync, it seems not to work for me). Also, if it were possible to view only unread items (i.e. automatically hide feeds that did not get updated) would be nice. @Tomáš It does not indeed autoupdate the feeds on startup. I could add that as an option for the next release. Regarding having a link for the source, yeah I’ll eventually add it. Need to think about the best UI for that. And filtering by read/unread status should also be possible. A native Maemo RSS reader that syncs unread status with Google Reader is my dream! Thanks for working on this. I have added all three, I hope you have luck with them. If implemented, I would fall in love with Resistance (so far, grr is better for me needs, but it is far from ideal and not actively developed – and the interface of ReSiStance is much better). I second the request for tt-rss support – I use tt-rss and it’s great. The mobile interface in tt-rss 1.5 actually works pretty nicely with the n900 browser, but a native client would be even better. I’ll check if the OP filed a bug yet, and if he didn’t, I will…thanks! Thank you all for the very kind comments, and all the suggestions but specially for the quick testing. I’m really sorry for the feeds in folders bug, but it’s a bit complicated to cover all the cases when you don’t know the scheme of the xml. I’ve just uploaded v0.8.1 to maemo-extras with that fix. Hope it works for most of you. bug filed – https://bugs.maemo.org/show_bug.cgi?id=11764 . Do I need something in order to run it? @Mona many thx for reporting. It’s indeed a serious bug. Expect a fix for that in 0.8.2. I’ll release it most likely during this weeked. @ReinoutS Guys I really appreciate your comments, but to report bugs, please use http://bugs.maemo.org. Regarding this issue @ReinoutS, what version are you talking about 0.8.1 or 0.8.2 ? I can import http://blog.xebia.com/feed/ perfectly. Do you mean adding that feed from scratch or getting it from Google Reader? Getting it from Google Reader, the xebia feed was the last one in a list. By the way, I do not know if it is worth reporting as a bug – using 0.8.2., initial synchronization to google reader first shows lots of unread posts with each feed and corrects itself only after the synchronization is done. I.e. 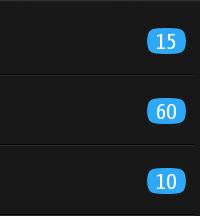 with each added feed from google reader, a certain number of unread posts is indicated. Only when the synchronization is complete (for all feeds), the number of unread posts is set right. It is a minor issue but it confused me a lot. Also it seems to me it slows the process a bit (ReSiStance downloads posts that already been read). @Tomáš actually that’s not a bug. ReSiStance downloads the feed items from the original source, i.e, it downloads what the original source provides. After that we perform a read/unread synchronization with google reader in order to know what items were read in Google Reader. It’s not a bug to download items previously read. Many people store their read items, because they want to read it again or whatever. Oh, I see. Does that mean that anytime you sync with Google Reader, ReSiStance first pulls all updates and then marks as read those that are unread in Google Reader? Well, I can see someone finds that useful. On the other hand, it is not very bandwidth friendly when on cellular, right? I would not mind if there were an option to download only unread items (if only because it is much faster to get updates then – I do most of my reading on a laptop and use the phone only occasionally), but it is not something I am terribly concerned about (and neither am I producing any patches). @Tomáš yeah well, the library used by ReSiStance does not allow you to select which posts you want to download. You could do that with Google Reader API but I don’t want to change the way ReSiStance works unless the performance degrades a lot easily when using Google Reader. @Tomáš @svillar I have added a button to open the source post to the 0.8.7 code as available in the Maemo repos, but I would like to submit them to svillar first for approval and possible merging. If svillar approves, we could get this added to the trunk and rolled into the next package. I can supply a diff of the changes to constants.py and gui.py.